The Offaly native kicked off his surge with an eagle on the fourth hole but McIlroy finished the stronger of the two. Rory McIlroy won his first European Tour title on European soil at Wentworth today. RORY MCILROY OVERCAME a tough week in his personal life to capture the European PGA title at Wentworth this afternoon. The Northern Irishman, who broke up from former fianceé Caroline Wozniacki earlier in the week, finished on -14 to edge out second placed Shane Lowry. McIlroy was two under for his round after 11 holes but recorded four more birdies over the closing seven holes to card a stunning round of 66. Lowry overtook Thomas Bjorn at the top of the leaderboard as play went down the back nine at Wentworth. He eagled the fourth and birdied the following hole. He bogeyed nine but claimed a shot back with a birdie on the par three 10th. The Offaly native reached -14 but a double bogey and bogey down the stretch cost him dear. He birdied 18 to finish on -13. Bjorn, who shot rounds of 62, 72 and 67 coming into today, birdied four to reach -16 but has bogeyed twice on the following holes. The major damage, however, came on the par four sixth as Bjorn double-bogeyed. He consolidated with a string of pars but failed to challenge the top two. Scotland’s Stephen Gallagher burnt up the course and posted a clubhouse score of -9 but McIlroy’s remarkable finish saw him finish well clear of that early marker. Luke Donald was third, on -12. Email “Rory McIlroy pips Shane Lowry to European PGA victory”. 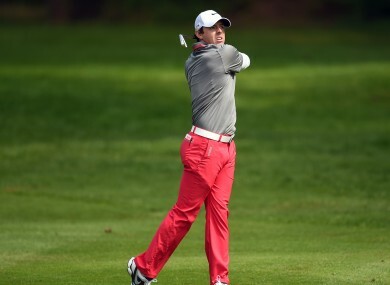 Feedback on “Rory McIlroy pips Shane Lowry to European PGA victory”.